This a fabulous walk with outstanding views that can be taken in one go (with a car shuffle) or broken into parts. This walk, with outstanding views, is an absolute delight. It can be taken in one go (with a car shuffle) or broken into parts, starting and returning from either Darby Saddle or Darby River.. The track from Darby Saddle provides spectacular coastal and forest scenery as it climbs uphill through stringybark and casuarina forest. 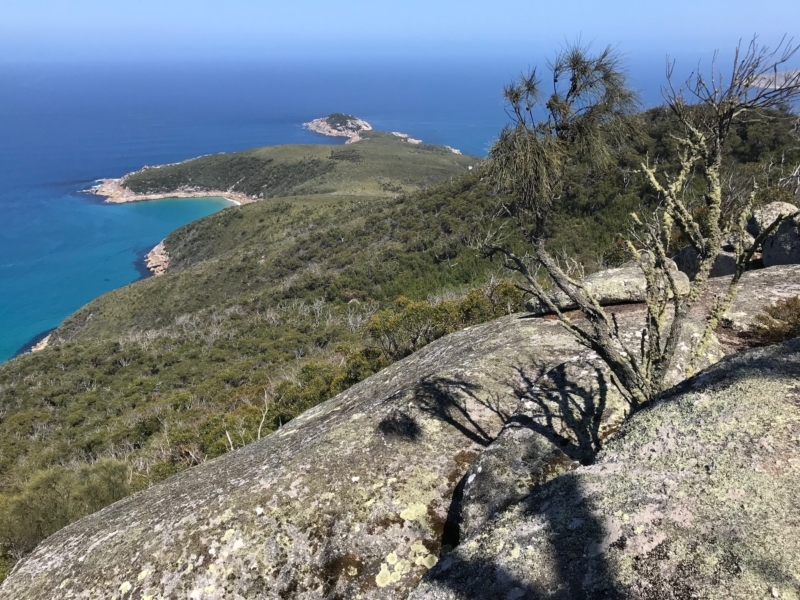 At 2.1 km a side track (300 metres) leads up to Sparkes Lookout which offers views as far as the pyramid-shaped Rodondo Island in the south and Shallow Inlet in the north as well as Tongue Point. 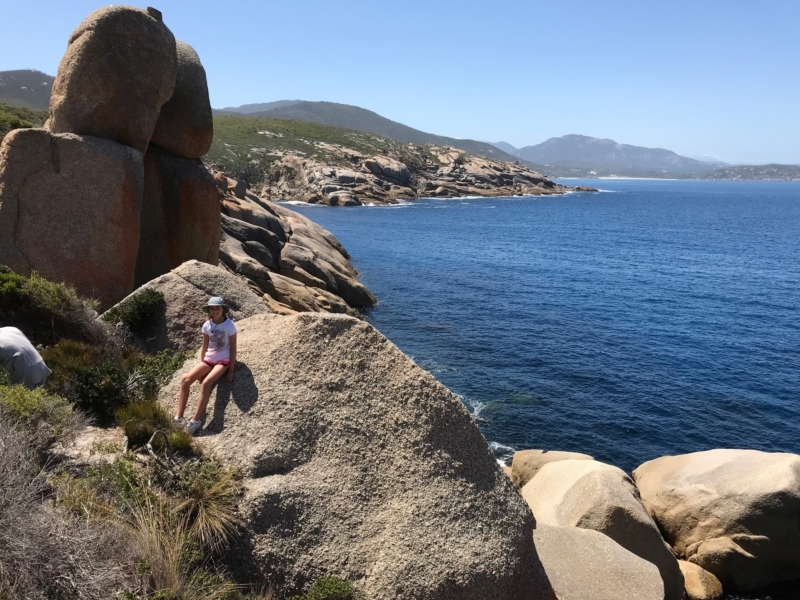 The short side detours off to Sparkes Lookout is well worth the effort. 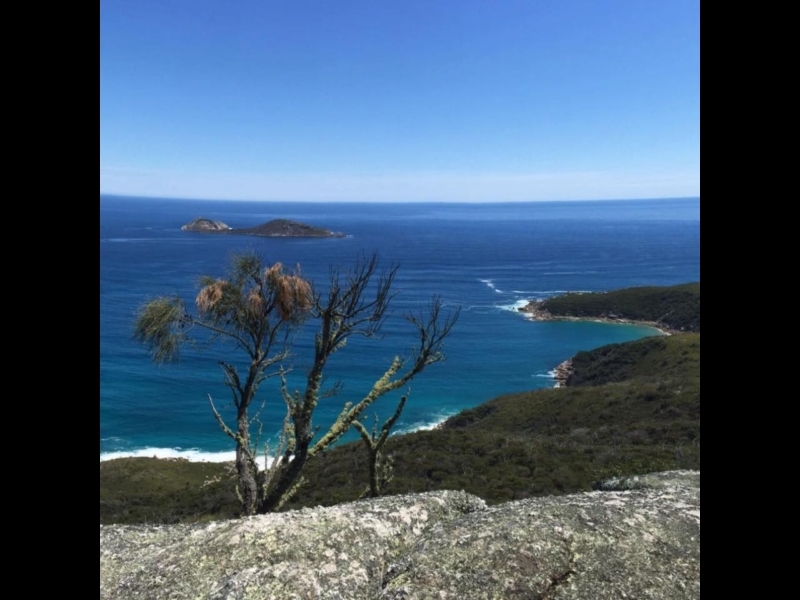 From Tongue Point to Darby River you can experience some great views of Darby Swamp, Vereker Range, Darby and Cotters Beach that ends with a descent to Darby River carpark through windswept coastal vegetation. If you have time and energy, the detour off to Fairy Cove is a beauty. 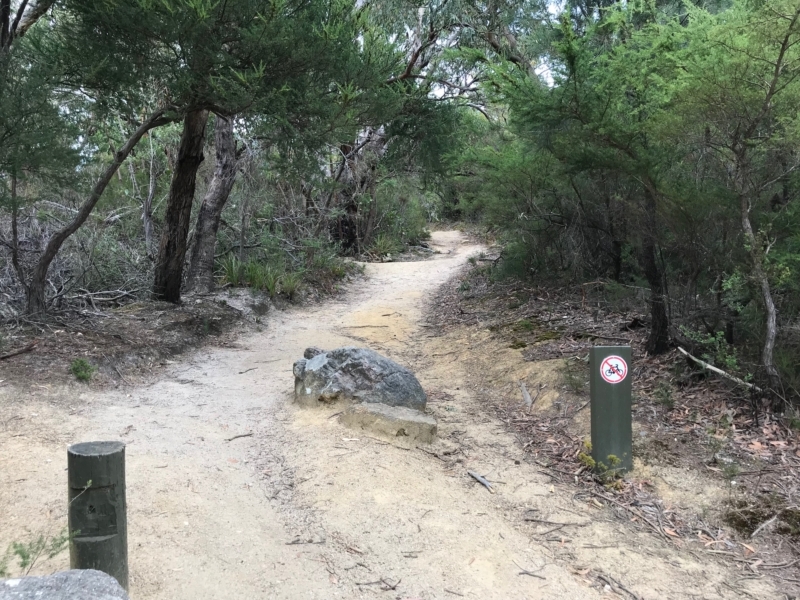 Information on the Parks Victoria website: "After the turnoff, the main track climbs steeply to Lookout Rocks, a vantage point offering views across to Norman Island. 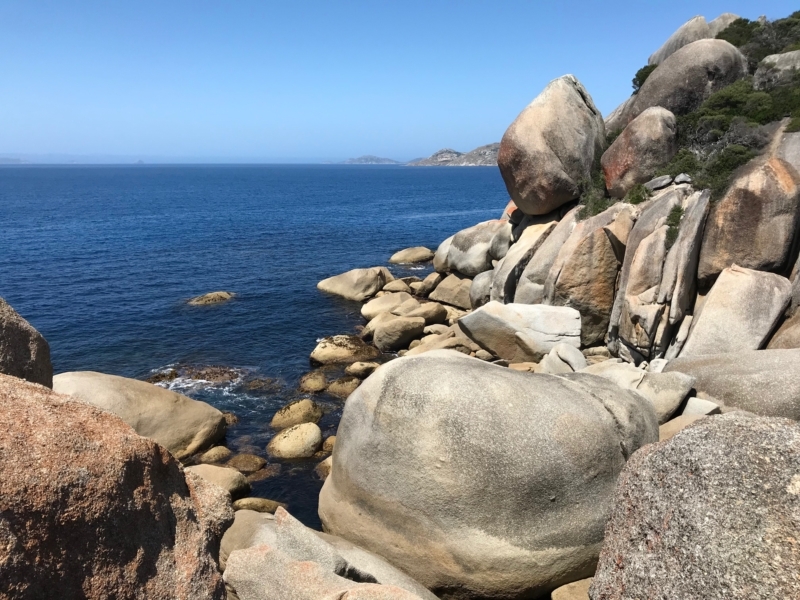 From here the track descends steeply through low heathland where it joins the track from Darby River and continues to Tongue Point, a coastal headland jewelled with tumbled stacks and boulders of weathered granite. The track ends prior to the semi-attached island. For your safety don’t attempt to cross over to it." A lot of the walk doesn't have a lot of shade, so probably best not to do on hot days and take lots of water. Note: Google has estimated the walk to be 2.5 hours, but 4-4.5 hours is more realistic. 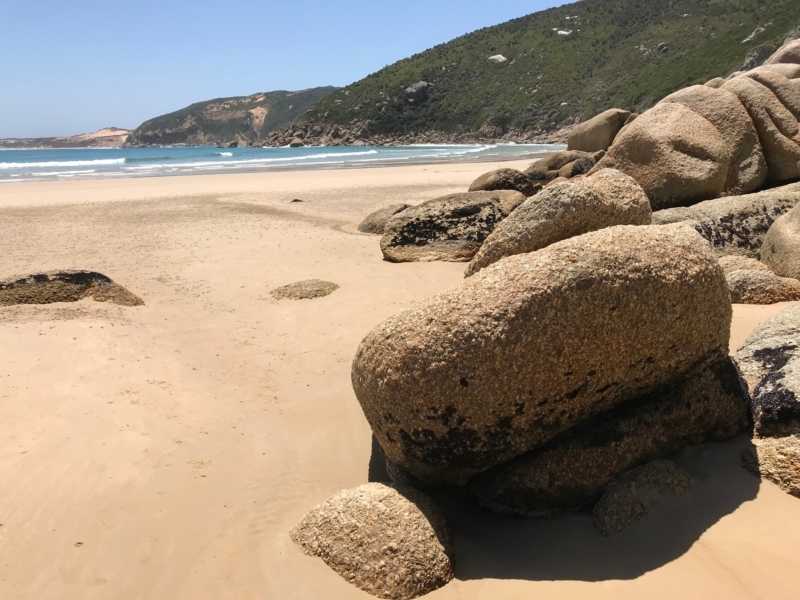 If you didn't want to do the whole walk or couldn't do a car shuffle, the walk from Darby River to Fairy Cove is about 5.6km return or the walk from Darby River to Tongue Points 7.6km return. As in everywhere in Wilsons Promontory, no dogs allowed. There is a car park on the Prom road then you are immediately on your way! 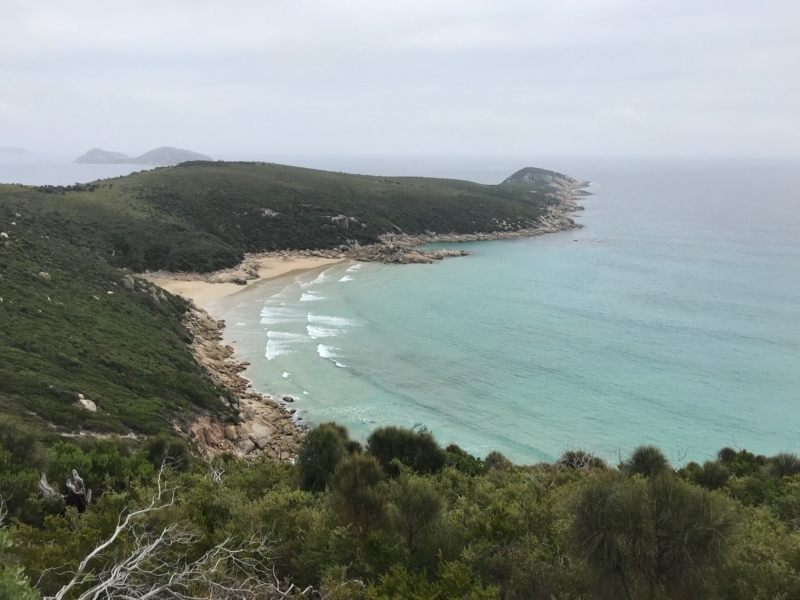 At 2.1 km a side track (300 metres) leads up to Sparkes Lookout which offers views as far as the pyramid-shaped Rodondo Island in the south and Shallow Inlet in the north, and of course Tongue Point. 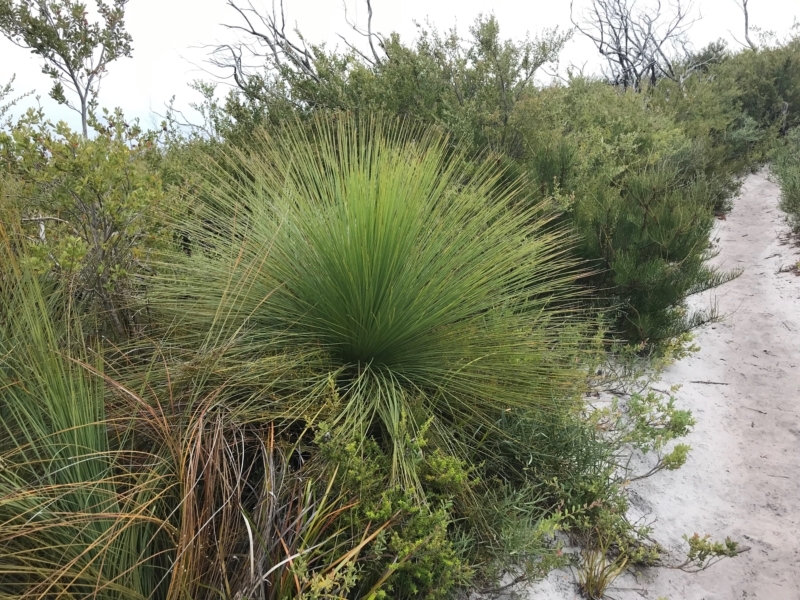 Always nice to see some grass trees (Xanthorrhoea) blowing on the breeze. 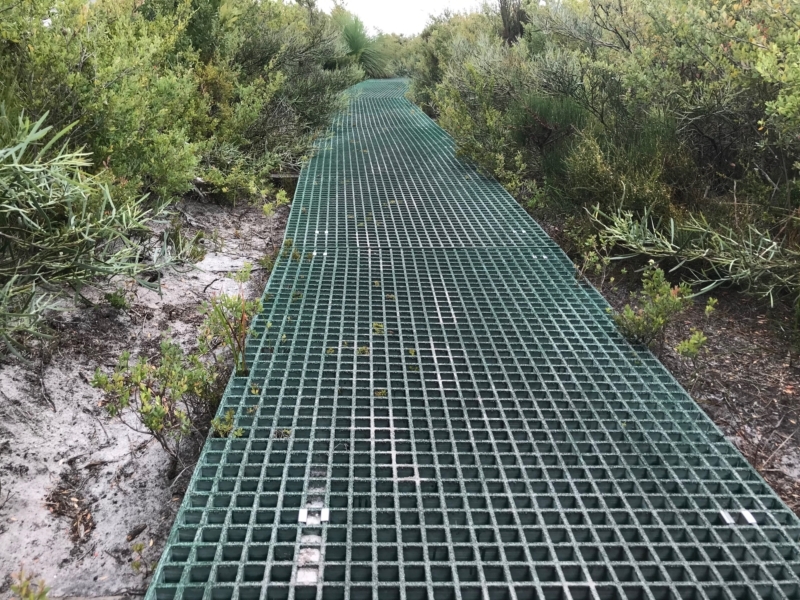 There are a couple of Boardwalks that protect the landscape and make the walking a little easier in parts. That's Norman Bay in the distance, with My Oberon behind, and you can see a glimpse of Squeaky Beach. The island is named after Captain William Henry Norman, who brought Sir Charles Hotham to Melbourne in Queen of the South in 1854. Weather permitting, its definitely worth clambering down the rocks to the water's edge. 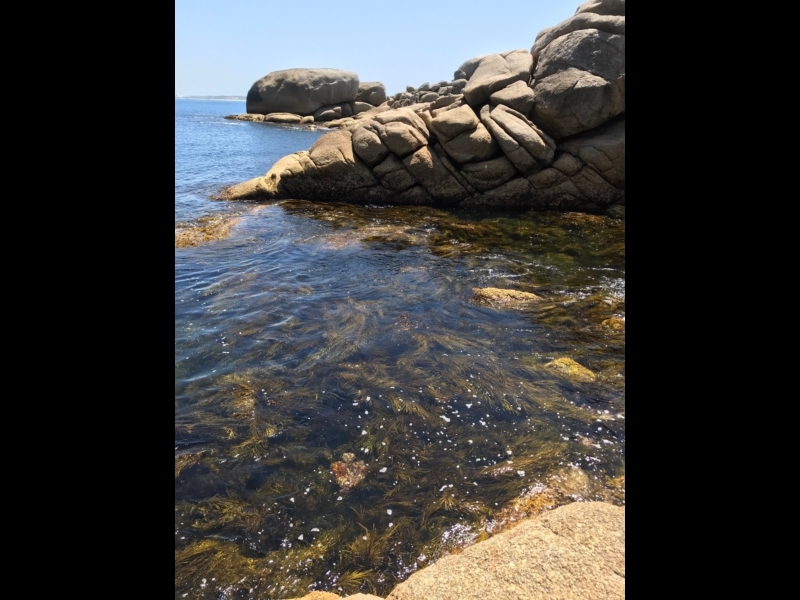 A beautiful little cover to explore and swim, as we did on the warmish day we were there. Its amazing the things you can find on secluded beaches. We wondered what this was, how old it was and from where it came. An old ship's boiler? Nice view back to Fairy Cove and Tonge Point. 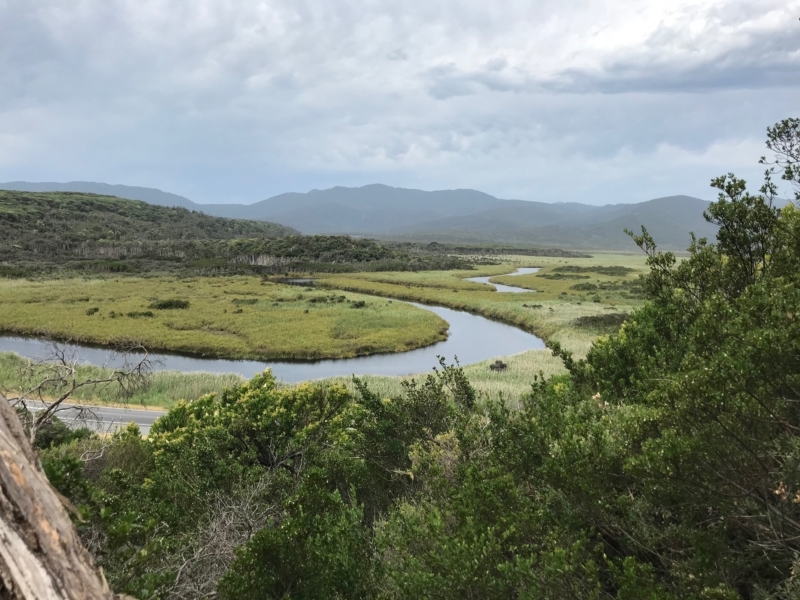 A great view of Darby River and swamp and the Vereker Range. 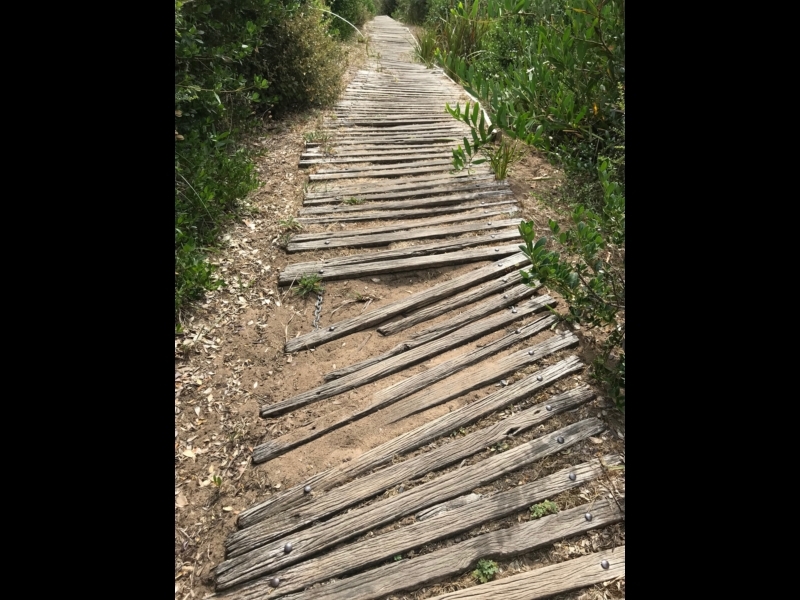 The track here has seen better days, so watch your step as you descend.